This feature highlights a number of meteor showers, comets and asteroids which are visible during the month of May 2010. Venus continues to ascend higher in the evening sky and is the brightest star during early evening hours. The major meteor shower, Eta Aquariids, will be washed out by a bright Last Quarter moon. Venus – Venus is the brilliant star low in the west during the early evening hours. It sets about 2 and half hours after the Sun. Venus will only get a little higher next month. From now till July/August it will ride as high as it’ll get for this apparition for northern observers. In fact, this is not a very good evening apparition for Venus. On the other hand, it is a great apparition for observers south of the Equator. For you, Venus will continue to climb till late August. Mars – This month the Earth and Mars continue to move further apart. As a result, Mars will continue to fade from magnitude +0.7 to +1.1. Still it will be a bright red beacon nearly overhead right after sundown. It’s brightness is comparable to that of the other bright stars. Note that unlike the stars which twinkle, Mars shines with an unwavering red glow. Saturn – Saturn was at opposition in Virgo on March 21. This month Saturn is visible in the east-southeast during the early evening hours. It will slowly fade from magnitude +0.8 to +1.0 throughout the month. Telescope users should note that Saturn’s rings are still within a few degrees of edge-on. Jupiter – Jupiter once again returns to sight as a brilliant star low in the east-southeast before dawn. The magnitude -2.2 planet will get brighter and better place for observing over the next few months. Mercury -Mercury will rise out of the dawn sky toward the end of the month. This morning apparition will not be good for northern observers. May starts to see an increase in meteor activity after a few months of low activity. The year is usually split in 2 with January through June having low rates with few major showers while July through December (really through the 1st week of January) have high rates with many major showers. Sporadic meteors are not part of any known meteor shower. They represent the background flux of meteors. Except for the few days per year when a major shower is active, most meteors that are observed are Sporadics. This is especially true for meteors observed during the evening. During May, 10-12 or so Sporadic meteors can be observed per hour from a dark moonless sky. Additional information on these showers and other minor showers not included here can be found at the following sites: Robert Lunsford’s Meteor Activity Outlook. There are 2 comets bright enough to be seen in small telescopes this month. Both were discovered by Rob McNaught of Australia during the Siding Spring Survey. As a result, both comets go by the moniker of Comet McNaught though they do have different designations [Comet C/2009 K5 (McNaught) and Comet C/2009 R1 (McNaught)]. The comet that should end the month as the brightest is Comet C/2009 R1 (McNaught). This comet was found on Sept. 9, 2009 with the 0.5-m Uppsala Schmidt telescope from Australia. At the time, the comet was a faint 17th magnitude. Perihelion will be on July 2nd of this year at a relatively small distance of 0.41 AU from the Sun. This month it will be 1.44 AU from the Sun and 1.96 AU from Earth on May 1st, 1.19 AU from the Sun and 1.61 AU from Earth on the 15th, and 0.90 AU from the Sun and 1.28 AU from Earth on the 31st. Currently the comet is around magnitude 10.0 and should brighten to ~7.0 by the end of the month. 10th magnitude requires a small telescope but under dark skies while 7th magnitude should be easy for small telescopes under most sky conditions and binoculars under a dark sky. It is a morning object as it moves from Pisces, through Pegasus and into Andromeda. This comet may even brighten to naked eye brightness (under very dark skies) in June. Of course with relatively small comets getting this close to the Sun, there is always a chance the comet will break up and disintegrate before it gets too bright (as C/2009 O2 did last month). Orbits and position of Comet C/2009 R1 and the planets for May 15, 2010. Image created with C2A. Credit: Carl Hergenrother. The 2nd ‘Comet McNaught’ is Comet C/2009 K5 (McNaught). It was discovered on May 27, 2009 deep in the southern sky. Similar to C/2009 R1, this comet was also found with the Uppsala schmidt at around magnitude 17. With perihelion on April 30 of this year at a distance of 1.42 AU from the Sun, C/2009 K5 is bright enough to be seen in small backyard telescopes from dark sites. 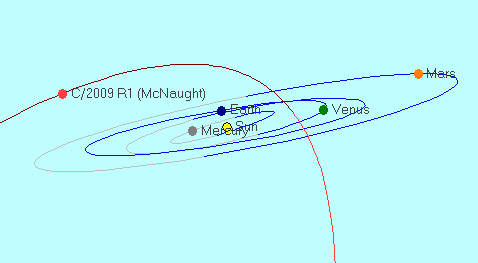 During the month it should be as bright as it gets at around magnitude 8.2 to 9.0. The comet will move through Cepheus and Camelopardalis. As the month progresses, the comet will have traveled far enough north to be circumpolar and visible all night long (for observers at northern mid-latitudes and further north). At mid-month it will be located 1.44 AU from the Sun and 1.51 AU from Earth. 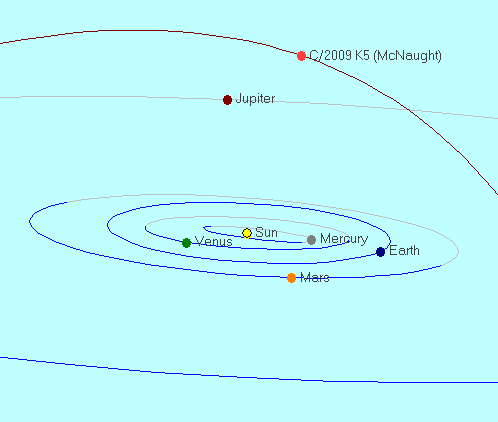 Orbits and position of Comet C/2009 K5 and the planets for May 15, 2010. Image created with C2A. Credit: Carl Hergenrother. The maps below were created from images taken with the Hubble Space Telescope. The geography is dominated by a large impact crater located near the south pole (the blue ‘donut’ in the elevation map). Perhaps this crater is the result of the impact that blasted off the smaller V-type asteroids. We’ll know more next year when NASA’s Dawn spacecraft enters orbit around Vesta for a full year. Currently the encounter is scheduled for July 2011 to July 2012. Vesta starts the month at magnitude 7.3 and steadily fades to mag 7.7. A small pair of binoculars will allow you to see Vesta among the stars of Leo. 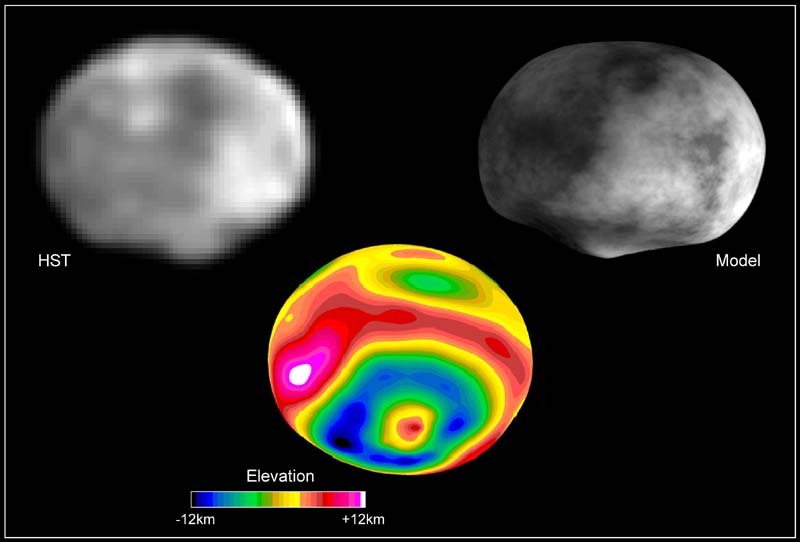 Pallas is a dark carbonaceous asteroid though with a slightly bluish B-type spectrum. Due to its high inclination (tilt of its orbit with respect to Earth’s orbit) of 34 degrees it is a difficult target for future spacecraft missions. Pallas is similar in size to Vesta with dimensions of 350x334x301 miles or 582x556x501 km. The reason it is fainter than Vesta is its darker albedo of 16%. Though no spacecraft are scheduled to visit Pallas, Hubble was able to get some good images that clearly show its nearly spherical shape. This month it fades from magnitude 8.7 to 9.0. Over the course of the month it travels north from the constellation of Serpens Caput into Corona Borealis. 2 fireballs came a crossed the sky in Winchester, VA on April 30, 2010 the first one around 8:59 pm and then the second one at around 9:12 pm. They came from the south west. They traveled at a slow rate of speed compared to some of the things I have seen like shooting stars. They looked like a big ball of fire. There was a lot of people that say them but I can’t find anything on the internet about this. These people like I was waiting for fireworks to start about around 9:30 pm and not these were not stray fireworks. People were pointing and saying … “look there is another one” It was a crowd of people but I can’t find anything about it on the net. Do you know anything about it or know where I can find out about it. I have pictures of them but it was taken with my cell phone and when you zoom in it just looks like a bunch up pixels. I actually finally got a response from someone about that firballs and it was actually something that was launch from a home that was shot a crossed the sky at two different times. The informed me that they could see where abouts it came from and that it did really look like a meteor and when they saw the second one and where it came from that they were disappointed to see it was a hoax. Thanks and if you would… please remove my postings on this matter since I finally know what it was. I saw what looked a large and dramatic meteor from Sacramento, CA on May 5th at about 10:30 PM. It was in the western sky and traveled from South West to North East. It had a very long and wide tail. Several kids in the neighborhood also saw it. I don’t have the exact time because I was walking my dogs. Anybody know what it was? I am living in the Sultanate of Oman, just south of Saudi Arabia. There has been a bright object in the sky, just above the eastern horizon, every morning for the last few weeks. It always appears just before the sun starts to rise, and almost above the sun but a little to the left. A few weeks ago it was in a slightly elongated “drop” form, with the tail pointing upward. It is brighter than Venus. I thought at first that it was a jet plane, but I watched it for several minutes and it never moved. Now it appears as a “pencil” shape, pointing to “3 o’clock.” I can find no information on the Internet about any highly visible comet. What can this thing be? Am I just missing the obvious? I just came in from my lanai to see try to find out what that light was. Soutwest sky, appears to be blinking red and green (or blue?) It isn’t moving horizontally but has descended since I first started watching it. It may be moving but may be too far away to detect the forward movement. I am in Southwest Florida also. Let me know if you find any more info on this…..
No, Susan, this thing doesn’t descend, it stays right in one place until the sun is more or less up, at which point the sky is too bright for met to see the object. I know it doesn’t move because I often go walking in the desert, starting before dawn. (In summer Oman is a steady 55 degrees Celsius for weeks at a time!) By coincidence I generally walk east. I saw this pencil thing clearly, this past Thursday morning, and it stayed in place for a good ten minutes or so, in other words between “first light” and full sunrise. (Well, yes, it “moves,” perhaps, but only keeping step with the sun, I would say.) The same idea as if you were looking at Mercury, for example — again, Mercury is close to the sun so you only have those few minutes when the sky is not too bright. (I’m a FAIRLY avid skywatcher.) But I can find no info about comets, planets, etc. that would fit. Would a manmade object have a long tail? Not likely, I guess, except a jet airplane contrail, but an airplane would be moving. And this thing is bright, at least as bright as Venus ever gets. It’s impossible to miss. So how is it that I’m the only person on Earth who can see it? Okay, it’s extraterrestrials, and I’m the Chosen One. But I’m looking for a more mainstream hypothesis. . . . Living in Oman MAY be part of the problem — this is a “developing” country, so most scientifically important events here don’t even make it into the news. It’s a paradise for geologists and archeologists, including amateurs like myself, but if I have any questions I’m out of luck. An Arab friend tells me it might be an illusion caused by desert atmospheric conditions. I never saw such a thing in all my years in Canada, but perhaps this illusion may have some relation to what in Canada we call sundogs. I live in Palm Coast, Florida and on the night of May 27th, 2010 i noticed in the sky what looked like a fireball going horizontal to the earth and half-way between the earth and the moon and it was moving fast towards me for about 2 minutes then all of a sudden it turned to my left for about 30 seconds then disappeared. While I was watching this I was on the phone and they went outside and saw it too. I looked on the news and on the internet and I did’nt see anything about a light in the sky or any meteor or anything. If anybody knows what that was or if they saw it please respond. very curious.